Early-stage breast cancer is commonly managed with surgery followed by adjuvant radiotherapy.,, Recent advancements in radiotherapy planning and delivery such as intensity-modulated radiotherapy (IMRT) and volumetric-modulated arc therapy (VMAT) have improved the efficacy of radiotherapy for breast cancer resulting in better survival rates and reduced normal tissue complications, which correlates to better quality-of-life. Techniques such as IMRT and VMAT help in substantial sparing of healthy normal tissues, improved target dose uniformity, and possible dose escalation. This is generally achieved by exposing larger volume of normal tissues to lower doses from scattered and leakage radiation due to the nature of these delivery techniques., Tissues receiving low doses are more prone to developing secondary malignancies because cell mutations are more dominant than cell kill at low doses., Consequently, patients treated with these techniques are at higher risk of radiation-induced secondary malignancy compared to conventional radiotherapy; this is due to increased number of monitor units (MU) and associated larger volumes receiving low doses., Grantzau et al. presented a population-based study on second primary cancers after adjuvant radiotherapy in early-stage breast cancer and found an association between radiotherapy and soft-tissue sarcomas. Although developing a secondary malignancy is shown to be a relatively low incidence in these cases, it is of important relevance for young patients, especially in breast cases where survival rates are high., Obedian et al. has shown that there is a risk of 10% and 5% for breast and nonbreast second malignancy, respectively, in radiotherapy followed by lumpectomy. Travis et al. have shown that there is a 3.2-fold increased second cancer risk (SCR) in cases where the dose is >4 Gy to the breast; this risk increased to 8-fold for a dose of >40 Gy to the breast. Moreover, it has also been shown that this risk increased substantially after 25 years after radiotherapy. This emphasizes the need to account for patient age at exposure and the age, for which the risk is being estimated. Organ equivalent dose (OED) which is the equivalent uniform dose that results in the same SCR as in an organ with nonuniform dose has been widely used in the literature to calculate SCR. The dose-effect relation at doses <2 Gy is believed to be linear. However, at doses >2 Gy, linear, plateau, and bell-shaped relations have been proposed in the literature. The dose-effect relationship for SCR is mainly derived from A-bomb survivors where the doses are much lower compared to doses delivered in radiotherapy., This hampers accurate prediction of SCR at higher doses where dose-effect relationship is not accurately known. To overcome this, Schneider and Walsh  combined the data collected from patients receiving radiotherapy for Hodgkin's disease with A-bomb survivor data. Using the combined data Schneider ,,, found various dose-response coefficients for different organs using a mechanistic model that takes cell proliferation and mutation into account for SCR estimation. The model is able to estimate the risk at low and high doses with reasonable accuracy. This model also accounts for fractionated dose delivery and heterogeneous dose distributions which are of importance in radiotherapy. This model can also be used to calculate SCR of carcinoma and sarcoma inductions separately depending on the tissue type of interest. Several studies have evaluated SCR following radiotherapy using OED as surrogate with linear, plateau, and bell-shaped dose-effect relationships., However, one model does not fit all tissue types and dose levels accurately, especially at higher doses. Other studies have reported excess absolute risk (EAR) and lifetime attributable risk (LAR) which are clinically more meaningful based on one or other dose-effect relation. The EAR estimates in radiotherapy reported in the literature have rarely accounted for the patient age at exposure and the age at which the risk is estimated. The aim of this study is to estimate the OED, EAR, and LAR using the mechanistic model for SCR estimation accounting for patient age and appropriate tissue-specific parameters for breast radiotherapy patients. Apart from this, integral dose which is considered to be closely associated with SCR has also been analyzed. An attempt was also made to find any correlation between MU and EAR. 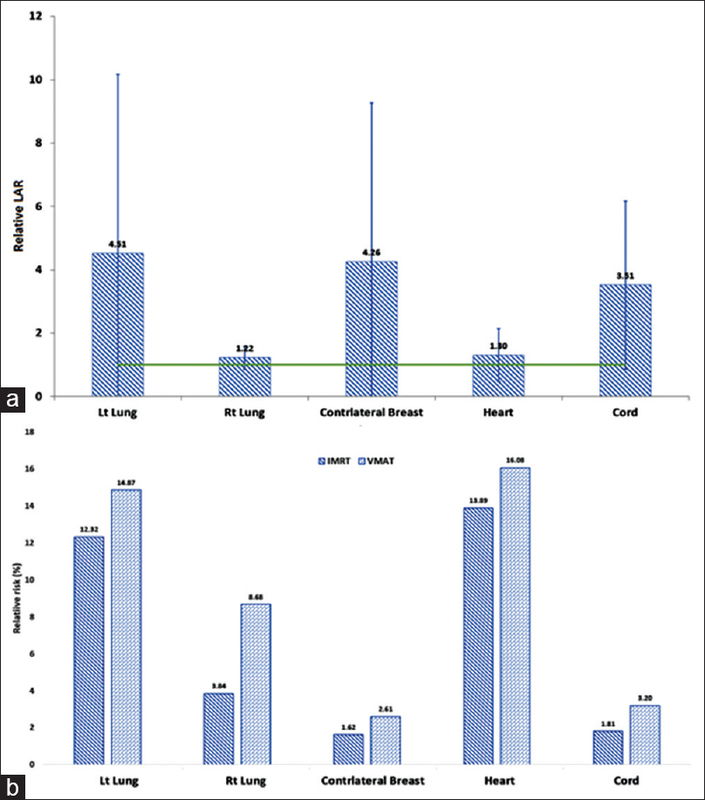 A cohort of 50 female patients with early-stage and ductal carcinoma in situ of left breast treated with dynamic IMRT was selected for this study. To emphasize the age-dependence of the risk, there was an attempt to select patients with different ages at the time of treatment. Patient's age ranged from 41 to 73 years with a median age of 54. The clinical target volume (CTV) and all organs-at-risk (OARs) such as left lung, right lung, contralateral breast, spinal cord, and heart were contoured by the treating radiation oncologist based on radiation therapy oncology group 1005 protocol. The planning target volume was generated by uniformly applying 0.5 cm margin around CTV. IMRT and VMAT plans were generated with Monaco® treatment planning system (Elekta, Stockholm, Sweden) with similar dose-volume constraints. Monte Carlo-based dose calculation engine was the preferred choice for this study as it is more accurate in calculating doses at low levels (where SCR can be high) than other model-based algorithms. The dose was calculated with a variance of 1% per plan on an Infinity® linear accelerator (Elekta, Stockholm, Sweden) with Agility® multi-leaf collimator. Dose-volume histograms (DVH) were calculated with a dose bin width of 0.01 Gy for organs of interest. To examine the impact of making a choice between IMRT and VMAT plans on the SCR, cases where an alternative VMAT plan was equally acceptable clinically, were generated with one or two partial arcs [Figure 1]. The prescription dose was 50 Gy in 25 fractions with four or five beams for the IMRT plans. The choice of energy was 6 or 10 MV for IMRT and VMAT. All plans met clinical protocols and constraints. The beam (central axis highlighted in black) and arc lengths for IMRT and VMAT is shown in [Figure 1]. where VT is the total volume of the organ of interest, Vi is the volume and REDi is the risk-equivalent dose in the ith DVH bin. Where α and β are the cell-kill parameters of the linear-quadratic model, D is the total dose, and d is the dose per fraction. R is the repopulation parameter ranging from 0 for no repopulation to 1 for full repopulation. The dose-effect relation for various models is shown in [Figure 2] for breast carcinoma induction. where γβ and γα are age modifying factors and β' is originally defined for persons exposed at age 30 and attaining age of 70 years. The EAR was calculated by assuming as agex30 years and also with the actual patient's age to demonstrate the impact of age into EAR calculation. The agea is set to 70 years for all patients. The parameters used for OED and EAR calculation with mechanistic model are given in [Table 1] for various organs. For other models, the parameter values used are taken from Schneider et al. The risk estimates were obtained by combining Japanese population and Western population according to ICRP 103. The relative risk (RR) of developing second cancer is calculated using LAR which is calculated using equation 9. RR provides an estimate of the excess risk posed by radiation therapy for an individual organ in a patient. The integration over EAR was performed over an attained age from a latent period (L) of solid cancer induction after the exposure (L = 5 years) to agea, of 70 years. The ratio S (agea)/S (agex) defines the probability of surviving from age at exposure to the attained age, which was obtained from life table for the US population. The RR is calculated as shown in equation 10. Integral dose which is a representation of the total radiation energy absorbed by the organ is calculated as volume times the mean dose of the organ in units of liter-Gy., The integral dose for different organs obtained for VMAT plans was compared with their corresponding integral dose in IMRT. The mean MU in IMRT and VMAT plans were 751.1 ± 133.3 and 1004.8 ± 180, respectively, with the exception of two VMAT plans, which had lesser MU than their corresponding IMRT plans. The OED calculated by various dose-effect models are shown in [Figure 3]. The OED values relative to IMRT are reported as relative values are less dependent on the accuracy of model parameters than their absolute values. 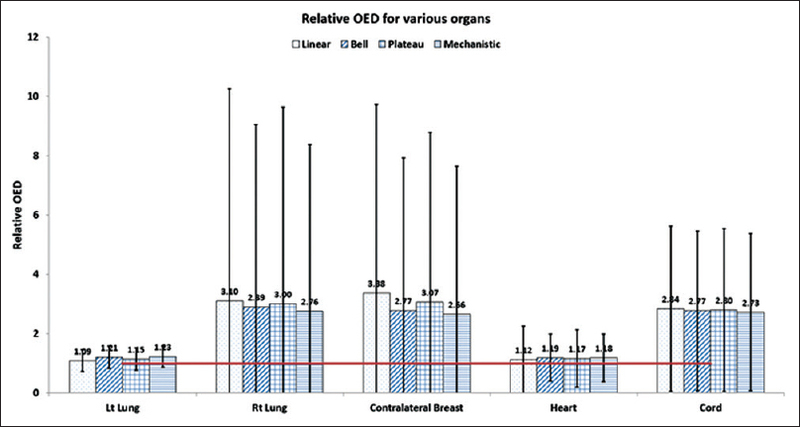 In general, all organs included in the study had a higher OED than IMRT indicating VMAT plans delivered a greater OED for all organs which can be associated with higher MU values. The relative OED values are considerably higher for contralateral breast and right lung, but the absolute OED is higher for the left lung in both IMRT and VMAT plans due to its close proximity to the target volume. The difference in values between models was found to be higher in the lung and breast compared to heart and spinal cord; however, the differences were not significantly higher. The standard deviations were also found to be high for right lung, contralateral breast, and spinal cord. 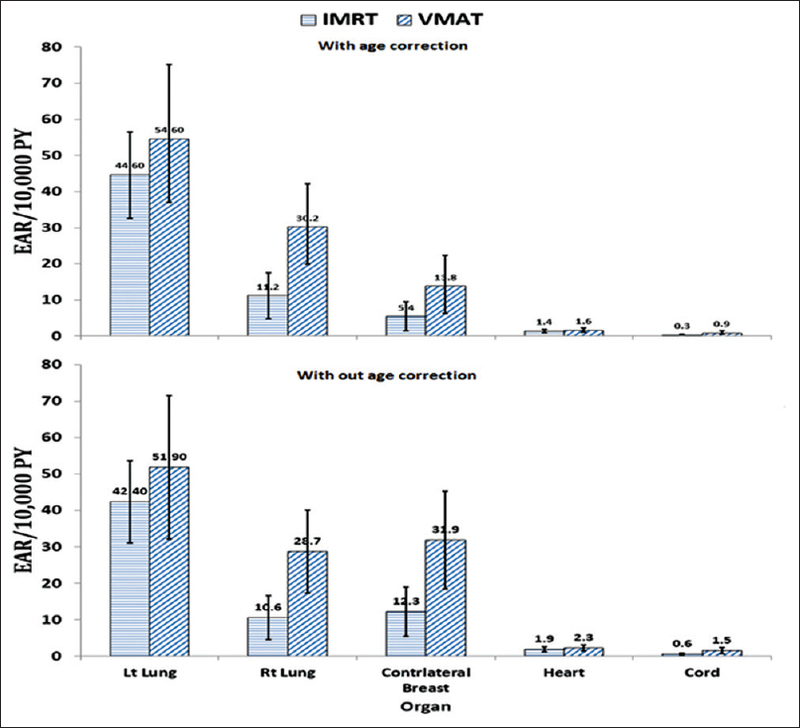 The mean EAR values per 10,000 person-years estimated for the IMRT and VMAT treatments including gender-specific correction with and without age correction factors are shown in [Figure 4]. The mean EAR values with one standard deviation without age correction were 42.4 ± 11.3, 10.6 ± 6.0, 12.3 ± 6.7, 1.9 ± 0.7, and 0.6 ± 0.3 for left lung, right lung, contralateral breast, heart, and spinal cord, respectively, for the IMRT plans. These values were 51.9 ± 19.7, 28.7 ± 11.4, 31.9 ± 13.4, 2.3 ± 0.8 and 1.5 ± 0.8 for the VMAT plans. However, the values were reduced with age correction, especially for the contralateral breast. The values obtained with age correction were 44.6 ± 11.9, 11.2 ± 6.4, 5.4 ± 4.0, 1.4 ± 0.5, and 0.3 ± 0.2 for left lung, right lung, contralateral breast, heart, and spinal cord, respectively, for the IMRT treatments and 54.6 ± 20.6, 30.2 ± 12.0, 13.8 ± 8.6, 1.6 ± 0.6, and 0.9 ± 0.5, respectively, for the VMAT treatments. The mean relative integral dose was also found to be higher for all organs in VMAT than in IMRT, especially for lung and contralateral breast. Similar to the OED, the relative increase in integral dose was lower for the left lung, but the absolute values were higher for both IMRT and VMAT. The standard deviation was also found to be very large which indicates that the values are patient anatomy specific despite same dose-volume constraints were achieved for all patient plans. The absolute integral doses were 13.08 ± 7.11, 2.13 ± 1.8, 2.03 ± 1.42, 1.91 ± 1.02, and 0.03 ± 0.02 litre-Gy for left lung, right lung, contralateral breast, heart, and cord, respectively, for the IMRT plans. These values were 14.31 ± 8.33, 6.53 ± 3.72, 6.83 ± 3.72, 2.23 ± 1.19, and 0.08 ± 0.05 for the VMAT plans. The relative integral dose for various organs is shown in [Figure 5]. The relative LAR were 1.22 ± 0.36, 4.51 ± 5.65, 4.26 ± 5.02, 1.30 ± 0.83, and 0.51 ± 2.65 for the left lung, right lung, contralateral breast, heart, and spinal cord, respectively. The RR values are shown in [Figure 6]a and the relative LAR in [Figure 6]b. 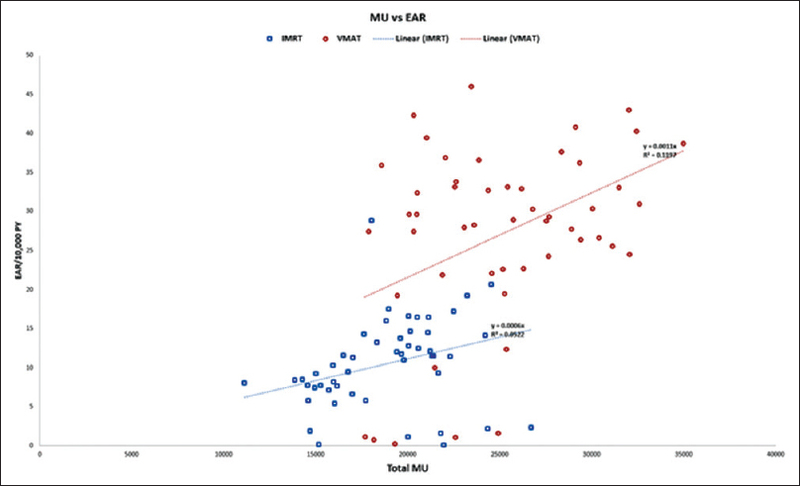 The total number of MUs in the plan and EAR had a very weak correlation for both IMRT and VMAT plans [Figure 6]. Donovan et al. concluded in his study that sophisticated methods for breast radiotherapy do not increase the theoretical risk of second cancer incidence for organs distant from the treated breast. In this study, the EAR values were higher for all organs in VMAT plans compared to IMRT. Our results showed that very likely the organ-at-risk of developing a second malignancy in IMRT and VMAT are left lung followed by right lung and contralateral breast with comparable EAR values. Heart and spinal cord had substantially lesser EAR than other organs. 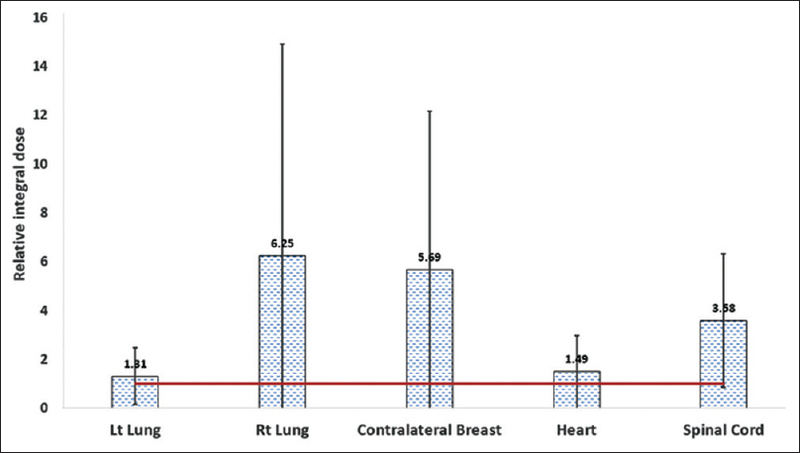 The EAR values when corrected for each patient's age at exposure increased marginally for left and right lungs but decreased for contralateral breast considerably. This is augmented by the fact that some tumors manifest at a much later stage than others. This observation can also be attributed by the fact that most patients in the study were close in age to 50 years. The EAR without correction assumes the age at exposure as 39 years, which in turn results in a higher EAR for the breast. However, for lung cases, the opposite was observed, which shows that lung carcinoma induction risk after radiotherapy reduces as time between exposure and patient's age increase. This shows the importance of incorporating patient's exposure age and age at risk is being estimated. The relative differences in integral dose are also similar that found in relative OED as they are proportional quantities. Relative integral dose also had a large standard deviation due to the large spread of values. It emphasizes the fact that a patient's anatomy plays an important factor in the resulting OED and integral dose values in organs at risk, despite the similarity in planning techniques, dose-volume constraints and sites. The relative increase in LAR is higher for left lung compared to right lung as observed in the relative OEDs. Lungs and contralateral breast had the highest increase in LAR similar to EAR as LAR is proportional to EAR. The increase in LAR is 4.5, 1.2, 4.3, and 3.5 times more in VMAT compared to IMRT for left lung, right lung, breast, and spinal cord, respectively. However, the RR which is an indicator of the excess risk of cancer induction excluding the risk of natural risk of cancer induction is lower for the breast compared to the lung. The heart also showed a higher RR followed by radiotherapy as cardiac cancer incidence is very rarely observed in the normal population (patients' not undergoing radiotherapy). Despite the fact that radiotherapy increases the risk of cancer incidence, the rate of incidence estimated from the study is relatively low given the benefit to the patients such as local control of tumor and increased survival rates. VMAT plans have increased the risk of SCR for all organs studied, but the increase in the risk is marginal. This marginal increased risk should be weighed against the benefits such as shorter treatment time resulting in reduced intrafraction geometric uncertainties, increased comfort to patients, and improved OAR sparing and more uniform dose delivery to the target volume. The RR found in our study in IMRT and VMAT averaged over all organs were 6.7% and 9.1%, respectively. This roughly corresponds with the value of 5.1% (2358 out of 46,176) of patients developing second malignancy reported by Grantzau et al. The slight increase in the risk obtained in our study can be seen in the light that majority of patients treated in their study were with tangential fields which deliver relatively lesser dose to out-of-field normal tissues compared to IMRT and VMAT. It should also be noted that the size of the patient population used by Grantzau et al. is much larger than in our study. Nevertheless, the increased risk of 1.6% and 4.0% found in our study compared to Grantzau et al. can be attributed to the increased integral dose in IMRT and VMAT. The major strength of this study is using the mechanistic model which is very important for nonuniform dose distribution and fractioned treatments for radiation-induced cancer risk estimation which is rarely reported in the literature for breast IMRT and VMAT plans. The other strengths are in using appropriate parameters for each organ as opposed to using a specific value for all organs which improves organ-specific risk assessment. Our results have also showed the importance of incorporating patient age at exposure. Our analysis also showed that there is a weak correlation (0.1197 for VMAT and 0.0522 for IMRT) between total MU in a plan and EAR [Figure 7]. Given the trend in radiotherapy with the array of treatment options available, SCR estimation tools will be of great use if available in treatment planning systems when comparing different plans in addition to evaluation of target and OAR constraints. This study summarized the methodology to assess SCR by low dose and high dose in the volume considered for treatment planning. Higher risks are found closer to the target, the region where most of the dose is delivered. VMAT plans had a higher SCR in all organs studied compared to IMRT plans. Although large difference in absolute risk was observed, the increase in RR was found to be marginal. The increase in risk was greater in both IMRT and VMAT for left lung and contralateral breast compared to other organs included in the study. Incorporating the age correction factor decreased the risk of contralateral breast SCR. No strong correlation was found between EAR and MU. American Cancer Society. Ref Type: Electronic Citation. Available from: http://www.cancer.org/cancer/breastcancer/detailedguide/breast-cancer-key-statistics/. [Updated 2017 Sep 09]. Braunstein S, Nakamura JL. Radiotherapy-induced malignancies: Review of clinical features, pathobiology, and evolving approaches for mitigating risk. Front Oncol 2013;3:73. Paganetti H. Assessment of the risk for developing a second malignancy from scattered and secondary radiation in radiation therapy. Health Phys 2012;103:652-61. National Research Council. Health Risks from Exposure to Low Levels of Ionizing Radiation: BEIR VII Phase 2. The National Academies Press;2006. Kry SF, Salehpour M, Followill DS, Stovall M, Kuban DA, White RA, et al. Out-of-field photon and neutron dose equivalents from step-and-shoot intensity-modulated radiation therapy. Int J Radiat Oncol Biol Phys 2005;62:1204-16. Grantzau T, Mellemkjær L, Overgaard J. Second primary cancers after adjuvant radiotherapy in early breast cancer patients: A national population based study under the Danish breast cancer cooperative group (DBCG). Radiother Oncol 2013;106:42-9. Storm HH, Kejs AM, Engholm G, Tryggvadóttir L, Klint A, Bray F, et al. Trends in the overall survival of cancer patients diagnosed 1964-2003 in the Nordic countries followed up to the end of 2006: The importance of case-mix. Acta Oncol 2010;49:713-24. Obedian E, Fischer DB, Haffty BG. Second malignancies after treatment of early-stage breast cancer: Lumpectomy and radiation therapy versus mastectomy. J Clin Oncol 2000;18:2406-12. Travis LB, Hill D, Dores GM, Gospodarowicz M, van Leeuwen FE, Holowaty E, et al. Cumulative absolute breast cancer risk for young women treated for Hodgkin lymphoma. J Natl Cancer Inst 2005;97:1428-37. 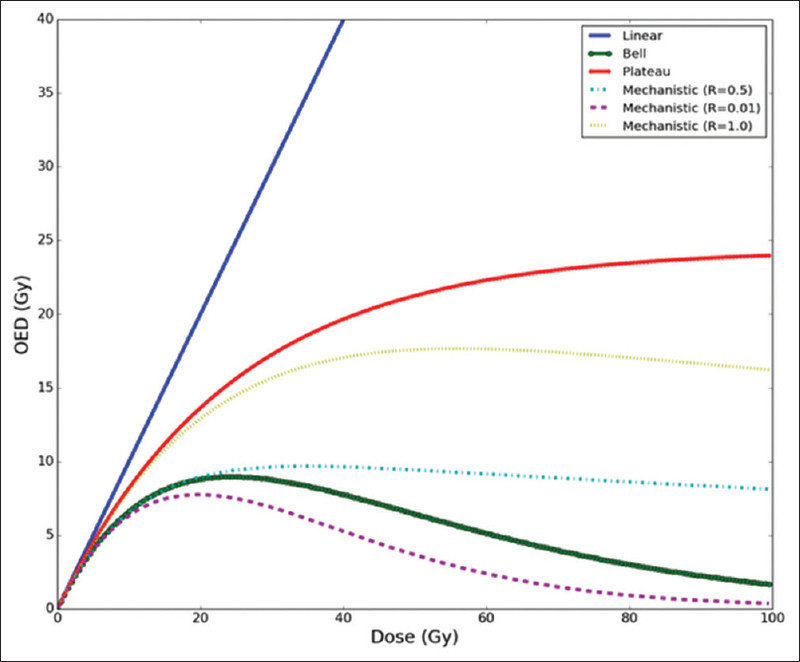 Schneider U, Walsh L. Cancer risk estimates from the combined Japanese A-bomb and Hodgkin cohorts for doses relevant to radiotherapy. Radiat Environ Biophys 2008;47:253-63. Schneider U. Modeling the risk of secondary malignancies after radiotherapy. Genes (Basel) 2011;2:1033-49. Schneider U, Sumila M, Robotka J, Gruber G, Mack A, Besserer J, et al. Dose-response relationship for breast cancer induction at radiotherapy dose. Radiat Oncol 2011;6:67. Murray LJ, Thompson CM, Lilley J, Cosgrove V, Franks K, Sebag-Montefiore D, et al. Radiation-induced second primary cancer risks from modern external beam radiotherapy for early prostate cancer: Impact of stereotactic ablative radiotherapy (SABR), volumetric modulated arc therapy (VMAT) and flattening filter free (FFF) radiotherapy. Phys Med Biol 2015;60:1237-57. Zwahlen DR, Ruben JD, Jones P, Gagliardi F, Millar JL, Schneider U, et al. Effect of intensity-modulated pelvic radiotherapy on second cancer risk in the postoperative treatment of endometrial and cervical cancer. Int J Radiat Oncol Biol Phys 2009;74:539-45. Mazonakis M, Varveris C, Lyraraki E, Damilakis J. Radiotherapy for stage I seminoma of the testis: Organ equivalent dose to partially in-field structures and second cancer risk estimates on the basis of a mechanistic, bell-shaped, and plateau model. Med Phys 2015;42:6309-16. Radiation Therapy Oncology Group. Ref Type: Electronic Citation. Available from: https://www.rtog.org/clinicaltrials/protocoltable/studydetails.aspx?study=1005/. [Version date 2017 Jul 31]. Schneider U, Sumila M, Robotka J. Site-specific dose-response relationships for cancer induction from the combined Japanese A-bomb and Hodgkin cohorts for doses relevant to radiotherapy. Theor Biol Med Model 2011;8:27. Jack V. The 2007 Recommendations of the International Commission on Radiological Protection. Oxford: Elsevier; 2007. Anderson RN, DeTurk PB. United States life tables, 1999. Natl Vital Stat Rep 2002;50:1-39. National Cancer Institute. Ref Type: Electronic Citation. Available from: http://www.seer.cancer.gov/statistics/types/lifetimerisk.html. [updated 2017 Jun 28]. Jothybasu KS, Bahl A, Subramani V, Rath GK, Sharma DN, Julka PK, et al. Static versus dynamic intensity-modulated radiotherapy: Profile of integral dose in carcinoma of the nasopharynx. J Med Phys 2009;34:66-72. Schneider U, Zwahlen D, Ross D, Kaser-Hotz B. Estimation of radiation-induced cancer from three-dimensional dose distributions: Concept of organ equivalent dose. Int J Radiat Oncol Biol Phys 2005;61:1510-5. Kim DW, Chung WK, Shin D, Hong S, Park SH, Park SY, et al. Risk of second cancer from scattered radiation of intensity-modulated radiotherapies with lung cancer. Radiat Oncol 2013;8:47. Donovan EM, James H, Bonora M, Yarnold JR, Evans PM. Second cancer incidence risk estimates using BEIR VII models for standard and complex external beam radiotherapy for early breast cancer. Med Phys 2012;39:5814-24.